I Rock London: Outdoor Entertainment with an Amazing View. Outdoor Entertainment with an Amazing View. The Scoop at More London (above) is an outdoor stage/ amphitheater where free films, music, and theater are offered all summer long. There are approximately 800 available seats and a small bar. 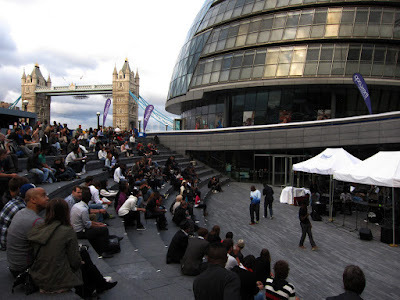 The Scoop is located between the London Bridge and Tower Bridge, immediately next to London's City Hall, on the south bank of the Thames. - Text by Erica Vines. Image by George Miller.